Acronis True Image protects your files, pictures, videos, operating system, applications, settings, and preferences. If your PC or Mac is lost, stolen, or damaged, you can easily and quickly restore your entire computer to its exact previous state to the same or different hardware. You can also restore just the files and folders you need. Save time and frustration with the industrys fastest backup and restore now optimized for Windows 10 and the latest OS X releases. Bought last years bloated garbage but then found Macrium Reflect Free Edition which is easier to use & does the job perfectly. Looking at the file size for Acrosis which is around half a GIG is beyond ridiculous, Macrium is around half that. If you must have all the bells & whistles then go for Acronis, if you live on planet Earth then go for Macrium. ATIH 2016 drops the ball with one of the worst UIs ever seen on a utility. It takes the "flat" look to dismal new depths that harm usability. Like the previous three versions you have to dig into logs to find out even basic info like which backup job ran last. It also failed to complete an incremental backup based on a ATIH 2014 full backup. Not impressed at all. I used Acronis years ago on my Windows XP computer, when I upgraded to Win 7, I started using the Windows 7 backup and restore feature which worked well for me. I just upgraded my win 7 system to Windows 10 but when I created a Windows 10 recovery disk, it would not boot on my win 10 system HUH? I downloaded ATI 2016 as a 30 day trial, created a boot disk, did a full backup and booted the ATI boot disk and tried a restore, it worked Perfectly. Plus instead of doing full backups, I now do incrementals for 14 days, then it does another full and frees up my backup disk space. I now highly recommend this software! BANDIT- why talk if you never used it? size of it that i can't figure... B U T.... There again I've never used it. Rollback Rx .8.1 installed = 58Mb. Then add your Image sizes. A baseLine Update gets rid of the Images. So back to 58Mb. ## (ALWAYS keep a Disk Image on External media. Amazingly, both the 2012 and now 2013 versions (bootable disks) will not detect the second of two "identical" drives (like Samsung SSD 64 GB and 128 GB, which are not even identical). A seemingly obvious, easily fixable, embarrassing bug that has lasted many months if not years, and speaks volumes of present-day Acronis (along with the poor reviews). Note: 2011 version does not have this problem, nor many others introduced lately. I think I now trust Microsoft's built-in, bare-bones offerings more than Acronis' bloat. Fileforum are having a laugh... 113MB install?? I think not. The link Fileforum have provided does not download the file, it takes to some software site! Shoddy! Product does what it is susposed to, however very bloated. I personally will stick with Macrium Reflect. i gave up acronis true image. windows 7 has it built in. and you can save multiple images/folders. just copy and paste the one you want to save, save it to a spot. whatever image/folder is in the default spot it will use upon a restore. its even in the help and support section about pasting multiple saved images. @ johnusa - Please confirm if you are referring to this build number 9788 or 2009 in general & do you have KB links to back up said known 'bug'. Can't say I have come into any issues with this build. @ Vantorax - Thanks. They also had same licence issue ages back. Fortunately it is an easy resolution, and does not in any other way affect the product, which has some nice improvements from the previous January build. DO NOT download this buggy version. Acronis knows it, and are working to fix the bug. This buggy version does NOT recognize legitimate serial #s, and keeps saying that the good serial # you have entered is incorrect. Don't waste your time, avoid a lot of headaches and bypass this bad version. Wait till Acronis fixes it and releases a new and hopefully a properly working version soon. This issue is only with this 9788 version. Previous versions of 2009 do not have serial # issues. Highly recommend not to install this buggy version, and wait till Acronis fixes this bug, and releases a newer version. At last, after many complaints, they did what they should have done yesterday. I have been using Norton Ghost for many years but after building a new machine found it very unreliable with SATA drives. 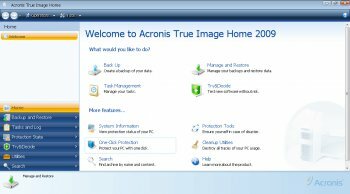 Acronis True Image seems to do the job better and more easily then Ghost, with more user functions. So far I would give it a 5 star rating.